Good Morning…I’m Stephen Woessner, CEO of Predictive ROI and your host for Onward Nation. Before we dive into today’s episode — which is going to be a solocast where it’ll be just you and me spending some time together exploring a topic that my team and I have been watching very closely — I want to make sure you’ve heard about our new Alexa Flash Briefing that we launched yesterday…and how you can get free access to the daily content. You can activate it with a simple voice command to your Amazon Echo device by saying…“Alexa, enable the Onward Nation Flash Briefing” and you will be all set to receive our daily, short, business building tips and strategies anytime you ask Alexa for your Flash Briefing. Please give it a try and let me know what you think — thumbs up or thumbs down. Your feedback helps us get better each and every day. And if you’re asking yourself, “What the heck is an Alexa Flash Briefing?”… during our time together in this solocast…I’m going to share the ins and outs to Alexa Skills and Briefings and how Alexa can impact your biz dev strategy in big ways…and I will share why my team and I at Predictive ROI have been studying the broader category of “Voice” for a while now…and I will even take you behind-the-curtain into the four reasons we felt it was important for us to launch the Onward Nation Flash Briefing. And just a heads up…if you would like to access the same market research and neuroscience data points that my team and have been studying as we worked through this decision making process…just go to our Predictive ROI YouTube channel and watch the video entitled “How to Use Voice as a Biz Dev Strategy.” It is all there. Ultimately, in my opinion, helpfulness should be the litmus test for whether you do something new or not. Does that new piece of tech or distribution channel give you an opportunity…in some way…big or small…to be more helpful to your customers and prospects. And if the answer is “yes”…then super awesome. If the answer is “no”…then that “thing” or “opportunity” is likely just fluff or marketing hyperbole — and hyperbole has no place in a discussion about how to build and scale your business. 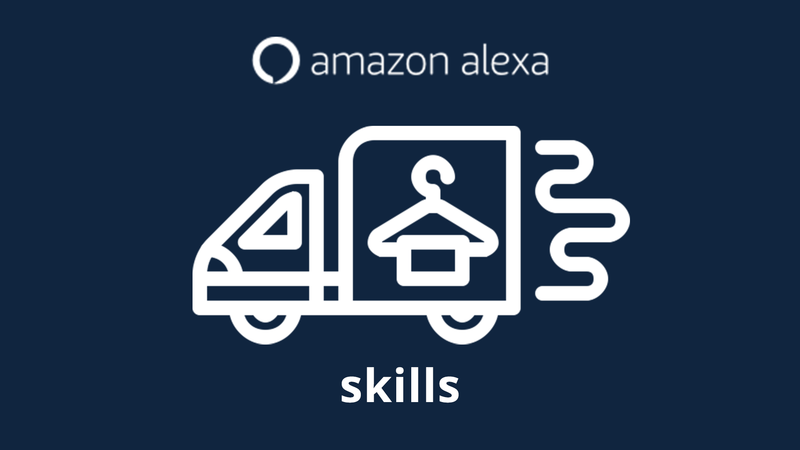 Okay, so let’s break it down…what are Alexa Skills…what are Alexa Flash Briefings…and what are the differences. Let’s first go down the path of Alexa Briefings first and then we will circle back and tackle Alexa Skills – because they are completely different topics. Alexa has a feature that is called your “Daily Flash Briefing” or just “Flash Briefing” for short. Your Amazon Echo device and your Alexa “account” came pre-installed with several Flash Briefings. So…if you asked Alexa right now, “Alexa, what’s my Flash Briefing”…she will play a series of daily news clips from the pre-installed sources…likely CNN, NPR, maybe CNBC that are currently subscribed for. And then if you go into the Alexa app on your phone – or at Amazon.com – you can either enable or disable the Flash Briefings that you receive. You can also enable or disable by voice command. Just like at the beginning of this solocast…I prompted you to say, “Alexa, enable the Onward Nation Flash Briefing” and then Alexa would add it to your account and then our daily content would become part of your daily news roll. And then depending upon what you have enabled, Alexa will begin to play those news clips – all back to back – automatically – one right after another. 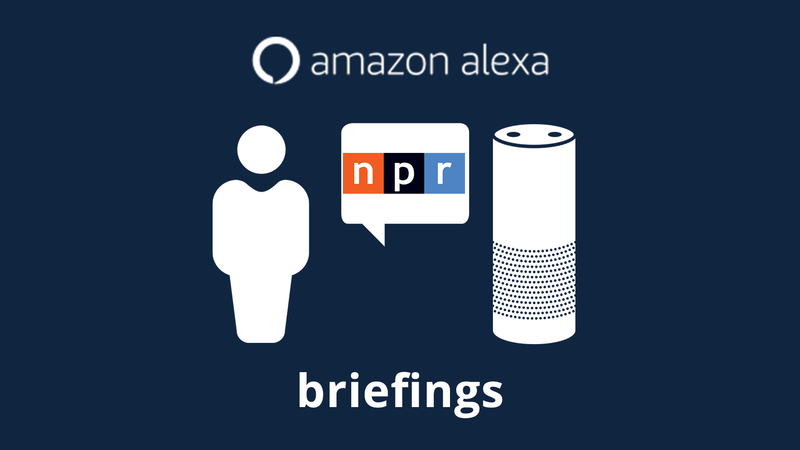 So say you enabled Onward Nation, NPR, and CNN…Alexa will play the Flash Briefing from all three of those sources…back to back…and then depending on the length of each clip…you will be all caught up with the news sources that are important to you. So tactically…that’s what Alexa Flash Briefings do. But now…let’s shift our perspective and think about the opportunity from the perspective of how you might be able to use this as a channel to be helpful to your customers and prospects. For example, are there pieces of relevant and helpful news you could share? Are there bite-sized portions of your thought leadership that might be inspiring to your customers and prospects as they move through their day? Maybe a curated snippet from your most recent article would really be helpful as they start their day, as they work through their day, or as they wind down their day. And if the answer is “yes”…then awesome. It may be time to start thinking about how you might build your own Alexa Flash Briefing. Okay, now let’s think through Alexa Skills. An Alexa Skill is essentially voice activated and controlled software that you can use to help your customers and prospects actually do something. For example, you can save them time placing an order with your company, accessing data and looking up reports, or learning more about your offerings. For example, there are a couple of Alexa Skills I think nail this and are great examples for you to check out, too. The first is LaundrApp. And darn it – at the time I am recording this – the service is only available in the UK – ugh – because I would so totally use this. It’s a laundry service that is activated by voice command to Alexa or through the app on your smartphone. Wait. What? I know…it’s awesome. So you could say, “Alexa, come pick up my laundry” and then a service van comes to the house, picks up the bag of your laundry, takes it back to the cleaners, cleans it, and brings you back fresh, clean, and folded clothes. And is all done through voice. Umm, yes, please. Okay, another Alexa Skill I encourage you to install and experiment with is by Johnnie Walker, the scotch whiskey brand. 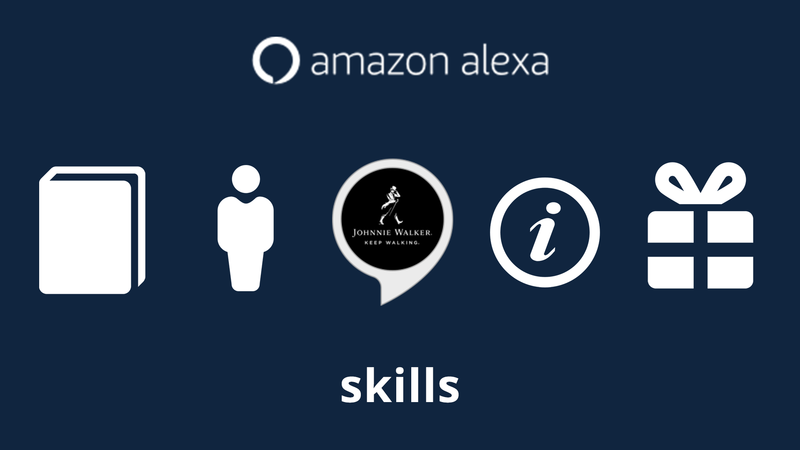 The only downside to it, in my opinion, is that the entire skill is narrated in Alexa’s voice, which is kind of cool when first using the skill…but after a while…it becomes a missed opportunity to blend in someone from the Johnnie Walker brand. So if you were to install the Johnnie Walker skill, which you can easily do by saying, “Alexa…enable the Johnnie Walker Skill” and then she will do that for you after she verbally checks your ID…which is fun and will make you laugh when she asks. Once the Skill is enabled…Alexa will offer you a self-directed tour through 4 different paths through the brand like the history of scotch or the history of Johnny Walker and then some fun facts, which is kind of cool. Alexa even provides as a narrated tour through Johnnie Walker’s portfolio products within the brand…all taking you down the path of becoming educated about the brand so at some point while using the skill…you might want to purchase a bottle for yourself or someone else as a gift. So again, Alexa Skills help your customers and prospects tactically do something…and in the case of the Johnnie Walker skill…the process is fun…or in the case of LaundrApp…really save your customers and prospects the time of having to call or even go online to order your service. But, there is also some functionality to Alexa that extends beyond the simple Alexa Skill and that is an offering called “Alexa for Business”. For example, Alexa will now integrate with your business’ Zoom account. Alexa will integrate with your Microsoft Office 365 account if you have one. Alexa will integrate with SAP and Salesforce, even G-suite, which is ironic since Google has a competing product, but Alexa will integrate across all of these various platforms so that you can say, “Alexa, start a meeting or turn down the lights or lock the doors or order new supplies for the copier or to go into SAP or Salesforce and say, run the third quarter numbers for this particular salesperson or the sales team or cost to goods” or whatever it might be, so you can now use voice-controlled devices and commands truly as part of your day-to-day operational strategy within your business. But the key to building a successful Alexa Skill is to focus on how you can use the technology to remove friction from your transaction process with customers. How can you be helpful or make it easier for your customers and prospects to do business with you? Okay…now that we’ve reviewed what Alexa Skills and Briefings are, I want to share why my team and I decided to launch the Onward Nation Flash Briefing for Alexa because that might be helpful as you and your team consider how Alexa may or may not fit into your biz dev strategy. Our first reason for launching the Onward Nation Flash Briefing was that a true thought leadership is not a one trick pony. Meaning, the content from a thought leader must be available in more than one channel. So we’re always on the lookout for new opportunities to share the insights and wisdom we collect from our Onward Nation guests – and to share them in new and different ways. Yes, we have our Onward Nation podcast…but that is just one channel. We have built out our Predictive ROI YouTube channel where I share different perspectives and tactical tips. And we now have our Onward Nation Flash Briefing so we can share daily snippets, helpful tips, and business building strategies. We have built a community of nearly 25,000 people on LinkedIn and I have contributed portions of my thought leadership with Forbes.com, Inc. Magazine, Entrepreneur.com, and have become a contributor to StartupNation.com. Our Onward Nation podcast is certainly the hub of my cornerstone content…but then we slice and dice it into all of these smaller spokes so it appears like I am everywhere. When in reality…we produced one piece of cornerstone content – an Onward Nation episode – and then my Predictive ROI team transformed it into a series of daily briefings on Alexa, a LinkedIn article, a blog post, an email campaign, or it became a script that I used when recording a YouTube video. All of the slicing and dicing brings more awareness to my thought leadership and opens up Predictive ROI to a variety of opportunities. And Alexa represents one more channel of distribution of our cornerstone content. Alexa is definitely an early land grab just like back in the pioneer days when very few settlers were living in the prairie. It is wide-open territory and filled with opportunity – as well as some risks. The audience is small – today – but that may not be the case tomorrow so being there early has some real benefit. And I think history has shown us that betting against Amazon’s success is likely not a good long-term strategy. Our second reason for launching our Onward Nation Flash Briefing is because voice and video is Predictive ROI’s core business. So it’s important for us to be on the cutting edge – to pioneer – to experiment – to truly know from our own experience what works and what doesn’t. At some point, I suspect some of our clients and prospects will see what we are doing with Alexa – how it is driving results for us – and then ask us to talk with them about the possibilities. But first – it’s important for us to be there so we have helpful insights to share. I think we all ought to be wary of the so-called expert who doesn’t eat his or her own dog food. Would you work out with an overweight personal trainer? Would you invest with a financial advisor who was not financially secure? I sure hope not. So, to demonstrate our willingness to learn and to share the good and bad of the journey in full transparency – it is important for us to invest the time and effort into ourselves, first. And our third reason was actually the most important. My team and I felt it was another way for us to be helpful to you, Onward Nation. We wanted to curate a daily series of snippets…of quick strategies…quick tips or an inspirational message…some 90-second bite-sized nuggets that we could share with you while you’re sipping your morning coffee, sitting at your desk and just needing a break, or maybe brushing your teeth in the morning and trying to get one more thing done before you run out the door for work…whatever or whenever we might fit it…we wanted to be helpful in that moment. So that is our ultimate goal…to be helpful. And that makes all of the effort and hard work worthwhile. So…I hope you will turn to your Amazon Echo device right now and say, “Alexa…enable the Onward Nation Flash Briefing” and give us a listen. And then please do drop me a line and let me know what you think — thumbs up or thumbs down — your feedback helps us get better each and every day. So with that said…thank you for taking the time to be here — thank you for sharing your feedback along the way — thank you for supporting what we are working so hard to accomplish here with Onward Nation. Please know — we greatly appreciate your support and look forward to being even more helpful as we continue doing what we are doing.